An email has been sent to you with a new-password, please use that passowrd for login and change it with your desired one from My Account page! Fields in red indicate compulsory fields! New to Form2pay? Sign Up Now! Enter the e-mail address associated with your form2pay.com account, then click Continue. We'll email you a new passowrd, where you can easily login with that new password and once logged-in change it to your desired password from the My Account page. 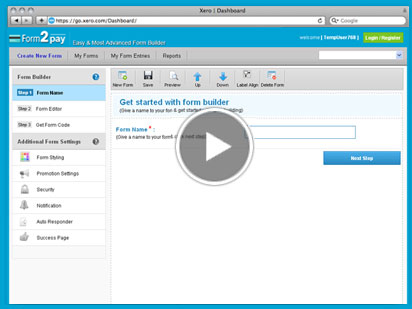 Form2pay is easy to use Online Form Builder - 100% Secured Html Form maker. We provide free, quality, high professional, reliable, secured and easy to use form builder for your website. Welcome to form2pay.com. We are a professional website that help online users to build form for their website. We provide free, quality, high professional, reliable, secured and easy to use form builder for your website. All submitted forms are safely kept in our database. Secured Login for safety of your data.Your data is automatically backed up & saved for your future reference. Do you've multiple websites, use our forms for unlimited websites no restriction. Unlimited Submissions. Select this option in case you want user to redirect to other page of your website.